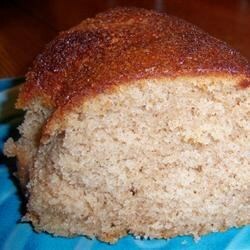 "This is a rich, moist and delicious spiced pound cake I have had since 1974 and always make it during fall and winter months. The cake needs no frosting except maybe a dusting of confectioners sugar." Preheat oven to 350 degrees F (175 degrees C). Grease and flour one 9x13 inch baking pan. In a large bowl, cream the butter or margarine with the sugar until light and fluffy. Beat in the flour, yogurt, eggs, vanilla, cinnamon, allspice, nutmeg, ground cloves, salt and baking soda. Mix until combined then beat at high speed for 2 minutes. Pour the batter into the prepared pan and bake at 350 degrees F (175 degrees C) for 30 to 35 minutes or until a toothpick inserted near the center comes out clean. Cool cake in pan on a wire rack for 15 minutes, remove from pan and continue to cool. Celebrate Fall with a beautiful bundt! i found this cake very dry, especially eating it teh day after cooking. not a cake that i will rush to re-make.